Because, well, who wanted to sleep in all summer anyway right? A little-known snippet of information about me is that just for fun, I hang out at 3RRR radio here in Melbourne and do Graveyard shows (that’s 2am-6am, yes – prime time) and fill spots for various people’s shows. You see I needed a new hobby when my fave hobby – drawing – became my job… No ambition here, I just love to do stuff that scares and challenges me a bit. So I stepped it up a notch this summer by committing to my very own fashion-themed summer show – Sundays 11am-12pm for 6 weeks starting today, and guess what? 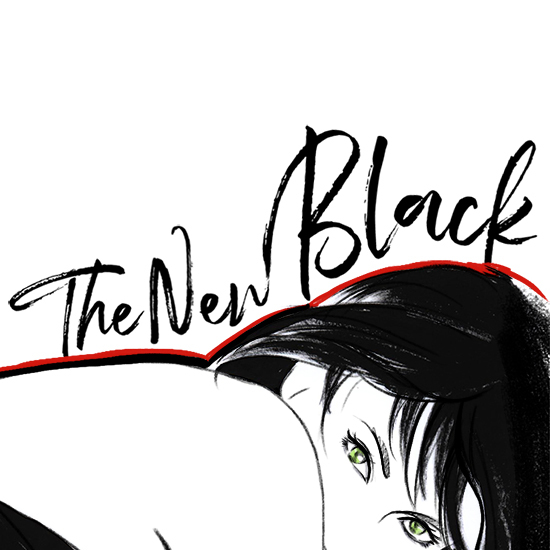 The show is called The New Black, and each week I’ll post a summary, some pics, and a link to listen back to the show. Oh wait, except I did the first show this morning and forgot to take any pics!!! Am I serious? Sadly yes… grrr. Episode 1 was themed “Why does everything look the same?” I was joined for the whole show by Karen Webster, one-time CEO of the L’oreal Melbourne Fashion Festival (from 2005-2010) and senior management of RMIT School of Fashion and Textiles, now design director at Buzz. She’s a maverick spirit, supporter of local designers, and go-to authority on all things fashion. Later in the show we were joined by Alice Edgeley of the fashion label Edgeley, which is the antithesis of everything we’d been talking about. Wish you heard it? Well you can listen back here – enjoy! Sign up here to receive your monthly newsletter and check out what's new in Patsyland. The Patsyfox Drawing Salon offers boutique Fashion Illustration classes for beginners as well as those with experience. Taught by Angie Réhe - illustrator and University lecturer, class sizes are small and most materials are provided. Introduction to Fashion Illustration 8-week course. Tuesday evenings 6.30pm - 9.30pm from September 4th. This is a comprehensive course covering all the most important things you need to know for fashion illustration. Suitable for complete beginners or those with experience. Draw Like the Masters - Classic Fashion Illustration. Sunday 16th September. 12.00pm - 4.00pm. The flair and artistic elan of the Masters are rarely matched in the modern day. There is a boldness and confidence that is full of movement and expression, and yet a complete economy of detail. Spend an afternoon discussing the greatest works of fashion illustration and applying the essence of their brilliance to your own series of sketches. Watercolour & Ink Technique. Sunday 7th October 10.30am - 4.30pm. Are you sick of making mud pies with your watercolours and inks? This intensive workshop will look at the ways that both media are used, starting with the various qualities of the media, and the importance of tools - brushes, paper, etc. We'll start with a range of fundamental techniques and progress through some advanced effects, specifically as used in Fashion Illustration. It will be creative, it will be fun, you will love it! So You Think You Can't Draw Faces? Sunday October 14th. A one-day intensive workshop exploring how to draw faces beautifully and correctly. Starting with the structure of the head and taking it through to stylised fashion faces. Fashion Illustration Bootcamp! Sunday November 18th 10.30am - 4.30pm. A one-day intensive workshop suitable for absolute beginners or those with some experience. Learn the key fundamentals of fashion illustration and how to get a great figure down on paper, then colour it in a dynamic manner. PRIVATE CLASSES - I have recently opened up some time again in my schedule for private tuition. Contact me directly for details. A more expensive option per hour, less time is required and lessons are designed and targeted specific to your requirements. Gift certificates! The gift that keeps on giving, you can purchase gift certificates for specific classes and workshops, or just as a value to contribute to any Drawing Salon workshops. Valid for 12 months. Limited class sizes - at The Drawing Salon size DOES matter. Email me for details. Let me teach you to draw! Fashion Illustration portraiture of the bride, Designer Illustrations, and personalised wedding stationery. For the bride who has everything...else. All drawings and content are copyright Angie Réhe and are not to be used or reproduced in any manner without written approval.